There is a great diversity of soil types across Victoria’s horticulture regions that reflect differences in parent material, topography, climate, landform processes and age (e.g. degree of weathering). These different soil types have a range of physical and chemical characteristics (e.g. structure, drainage, depth, pH, sodicity) that impact on management. The map of Victorian Horticulture Region Soils is a consistent and broad statewide overview that displays the dominant Soil Orders, according to the Australian Soil Classification (Isbell, 2002). Horticulture areas shown here have been derived from information in the Victorian Land Use Information System (VLUIS) and by air-photo interpretation. They may not represent all horticultural activity, and may over-represent some, but will be continually improved as updated information becomes available. The high resolution PDF file provided on this page can be viewed using the free Adobe Reader software and this can be installed from the Adobe website (external link). This PDF is provided with a high level of detail and with the intent that it should be printed at a high resolution. Also, The Soil and Land Survey Directory enables you to search for and access legacy soil and landscape survey reports based on a Local Government Area or catchment management region of interest. Texture contrast soils are widespread in most Victorian horticulture cropping regions. 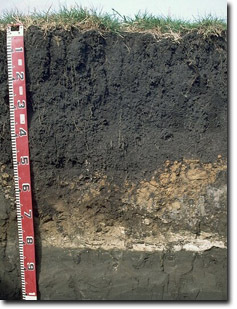 These soils are typified by a strong texture contrast between lighter textured surface (A) horizons and the heavier textured clay subsoil (B horizons). They can be can be divided into three broad Soil Orders; Sodosols, Kurosols and Chromosols, based on key subsoil properties such as pH and sodicity that are important for management. Sodosols have subsoils that are not strongly acid (i.e. pH >5.5 in water) but are sodic and usually dense and coarsely structured. Red Sodosols (historically referred to as ‘red-brown earths’) occur extensively on the older alluvial plains in northern Victoria. Black and Brown Sodosols more commonly occur in South West Victoria, associated with basalt plains and rises. 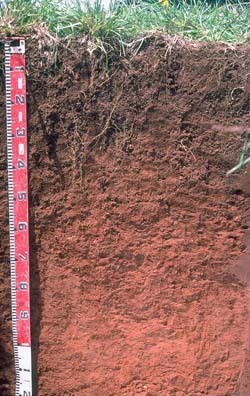 Kurosols have clay subsoils that are strongly acid (i.e. pH less than 5.5 in water). They are not a common soil used for horticulture and mainly occur on hills in the relatively higher rainfall areas in central, south-west and north-east Victoria where they are most typically used for viticulture. More detailed information about Kurosols in Victorian horticulture cropping regions. Chromosols have clay subsoils that are not strongly acid (i.e. pH 5.5 or greater in water) and are non-sodic. 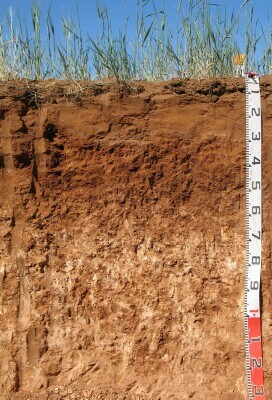 These soils are common on the volcanic plains in South West Victoria and also occur on hills and rises in central and north-east Victoria. Brown Chromosols are also common on the Mornington Peninsula. More detailed information about Chromosols in Victorian horticulture cropping regions. 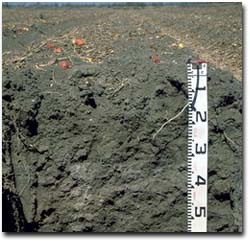 Cracking clay soils are referred to as Vertosols in the Australian Soil Classification. They are clay soils (> 35% clay throughout the soil profile) that shrink and swell causing seasonal cracking as the soil dries out. Grey Vertosols are common in the northern Victorian riverine plain, particularly on large floodplains in the Murray and Loddon valleys. They are also widespread in the Wimmera region, usually occurring on level to gently undulating gilgaied plains. A small area of self-mulching Black Vertosols occurs in the Dalmore area in the Port Phillip and Westernport region. More detailed information about Vertosols in Victorian horticulture cropping regions. A Grey Vertosol near Corop used for tomato cropping. This broad group consists of a diverse range of soils that are mainly sandy (particularly in the upper 60 cm of the soil profile). Podosols are mainly sandy throughout with accumulations of organic materials and aluminium (with or without iron compounds), often referred to as “coffee rock”, in the subsoil. They are not a common soil and occur mostly in the far south-west. Calcareous sands are common in the Mallee region where they are associated with east-west trending dunes. They are calcareous throughout, with visible accumulations of calcium carbonate (lime), as soft or hard fragments, increasing with depth. 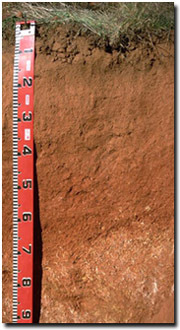 Soils with thick sandy surface horizons overlying clay subsoils are also included in the sandy soils category. These soils are commonly found on sand sheets, low dunes and hill slopes in the Wimmera and southern Mallee regions and may occur in association with Podosols. They are characterised by thick sandy surface horizons (60 cm or greater in depth) overlying a clay subsoil (that is often sodic). 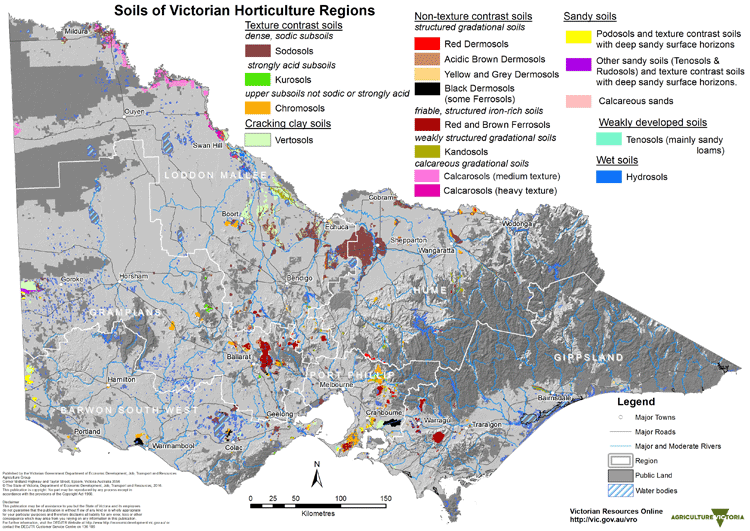 More detailed information about Sandy Soils in Victorian horticulture cropping regions. 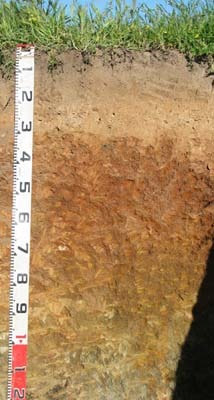 Thinner irregular coffee rock layer (Bhs horizon) at 80 cm depth in a Cranbourne Podosol. Dermosols are non-texture contrast earthy soils, that have moderately deep and reasonably well structured subsoils. Well-structured Black Dermosols are common on volcanic ash deposits in South West Victoria. They also occur on former swamps in the Koo-Wee-Rup region, where they are often associated with peaty material at various depths. Ferrosols (previously referred to as ‘krasnozems’) are deep, strongly-structured and friable red and brown soils that have formed on basalt. They are high in free iron oxide and clay, and are generally strongly acidic. Red Ferrosols are common in central Victoria (Ballarat and Daylesford regions), and in the Port Phillip (Red Hill, Monbulk, Silvan) and West Gippsland (Warragul, Thorpdale) regions. They are well suited for horticulture. More detailed information about Ferrosols in Victorian horticulture cropping regions. 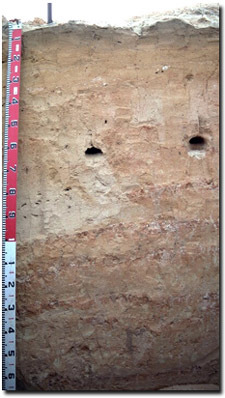 Kandosols are non-texture contrast earthy soils that are structureless, or have only weakly structured subsoils. They are often associated with alluvial landscapes, such as in the Lindenow area. More detailed information about Kandosols in Victorian horticulture cropping regions. Calcarosols are calcareous throughout and contain calcium carbonate (lime) as soft or hard white fragments, usually increasing at depth. They are widespread soils in the Mallee and Wimmera grain cropping region. Medium textured Calcarosols are common in the central and northern Mallee region. 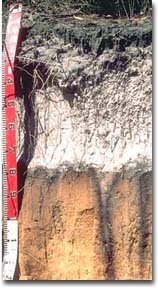 These soils typically have sandy loam to light sandy clay loam surface horizons, and soil texture increases gradually with depth further down the soil profile. In many areas these soils occur in association with Calcareous sands on east-west dunes.